I really like the RTH feature Walkability Fail. Often, I have already experienced the specific issues that are raised, but sometimes the contributors identify areas of concern that I had not considered, and make me see them from a different angle. The photo faces south toward Aberdeen: in the foreground you can see a single patch of "dry" (by which I mean not entirely submerged) sidewalk, surrounded by areas of sidewalk that are completely covered in water. 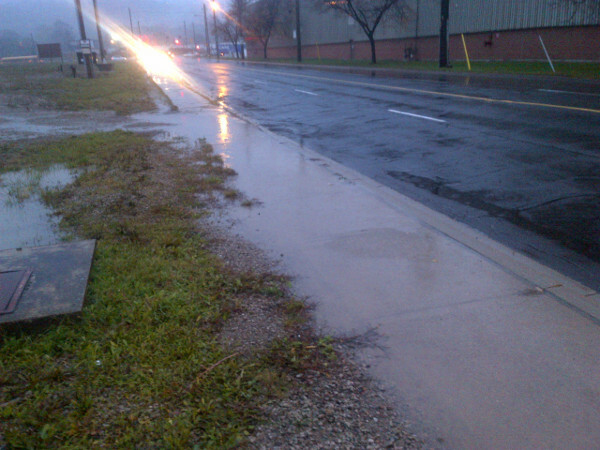 Southwards in the photograph, the entirety of the sidewalk is under water, at points up to a depth in excess of five centimeters by my estimate, along with areas of the lot adjacent to the sidewalk. Today's rain is "light" by any reasonable definition, or at least certainly not "heavy." The weather report called for 5-10 mm this morning, and 10-20 mm tonight. The grading of the sidewalk is inconsistent and improper in a way that makes some areas of the sidewalk function like drainage ditches, collecting water that drains off the adjacent lot and storing it directly in people's paths. This is the situation after any amount of rainfall, and people on foot have to go around stretches of sidewalk many meters in length. The reason I think this is a good example is that this area - the West Hamilton Innovation District - has been highlighted many times by the City and others as being of particular importance in terms of walkability. Plans of varying quality have been proposed to make the area safer and better for road users of all types. But one thing that should be done everywhere as a matter of course - basic sidewalk maintenance - has been neglected, perhaps because the adjacent lot will be redeveloped in the future. Properly grading the sidewalk would be a big incremental step towards achieving some basic walkability in the area, and even that is not done. No wonder the city wants a 5-lane mega road through there. Look at that traffic congestion. Incredible. Heh. I actually have a meeting at the city this afternoon to talk about the recommended lane configuration (two in each direction, plus a centre turn lane) and whether that is justified by the 18,000 cars a day Longwood carries. I hope you're bringing up bike lanes. Lots of people bike to MIP already, and more would if it was safe & easy to do so. LOL, do you have stats to back up that baseless claim? I'd say a lot of people would hang glide in, but it's too unsafe with all the wires and trees.